We don't get to the Full Moon Cafe often enough. Life often gets in the way, other commitments, or an overarching need to stay home. Last night, Dylan wanted to go; so we did. 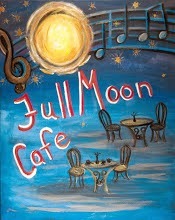 The Full Moon Cafe is a grassroots monthly sharing of talents that has been happening for the better part of a decade. It often happens in the intimate confines of the Waterways Community Centre. It's pretty small, perhaps the size of an average school classroom, but warm and inviting. The volunteer organizers have evolved a room set-up that works well, black cloth draped on the ceiling, several Full Moon Cafe inspired painting on easels, a couple of feature lights and a welcome table. In the basement, coffee, tea and cookies are available. It was pretty much a full house last night, maybe 30 people by the time the open mic portion was well underway. There was a slightly smaller number participating in the drumming circle when Dylan and I arrived. First to the microphone was Mattea, a colleague from Hometown...The Musical!, who did two short demonstrations of Aboriginal drumming and singing. Mattea is an autistic adult, who has made enormous leaps and bounds through the arts. With a bright smile, she throws caution to the wind and puts herself out there. I read a short story next: In search of the chirp. They welcome literary artists as well at the Full Moon Cafe. Nathan (the Poet) was also in the house, and presented a number of amazing works including one that he had shared with me earlier in the week. Being at the Full Moon Cafe gave us a chance to hear Helena again. In grade 9 at Father Mercredi High School, this young lady is one of the most naturally gifted singers I have ever heard. She did a couple of covers, one of a Taylor Swift song, that blew me away. She was then joined by Amanda for the final piece, filled with beautiful harmonies. "Excuse my ignorance," I said to Helena during the break, "but I'm not familiar with Taylor Swift's music - I'm too old. Do you copy her style?" "I listen to the songs I sing a lot," she said. "But I always do something different with them." Helena has begun writing her own stuff, which is great news. She has a gift. I'd be first in line to buy an album filled with her exquisite voice. It was great to hear Soren's songs last night. An instructor at Keyano College, Soren is originally from Romania, and shared a song about harvesting sunflowers in his native language. It was lovely. He also did a song called "All of Me" by John Legend. It was Dylan's favourite. I was so pleased to connect with Nathaniel Laws, a music teacher from St. Gabriel School. He reminded me that we had met at interPLAY a number of years ago and that I had taken a tumble in the dark during Hometown...The Musical! right into him and his trumpet. Apparently the dents have been successful repaired. He played a version of "Summertime", then moved over to the piano for a duet with Francesco on guitar. The Beatles song, which had dissonant chords built in, was made even more dissonant by the untuned piano. It was more magical that way. Dave Martin is in his element at the Full Moon Cafe. 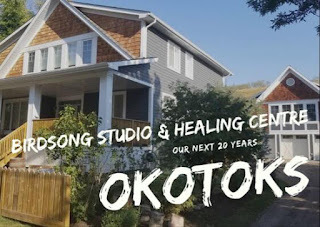 The singer/songwriter, teacher, and arts champion shared some valuable perspectives and stories, and a number of self-penned songs. What I try to do with paint, Dave does through words and music. He is a force for good in this community, using his music to encourage the community and other artists. Dylan got up to sing a Frank Sinatra song, "Fly Me To the Moon". He gets more comfortable in front of an audience each time he gets to a microphone. His low, sonorous voice, has a lot of potential. He also has a natural sense of humour that endears him to an audience immediately. 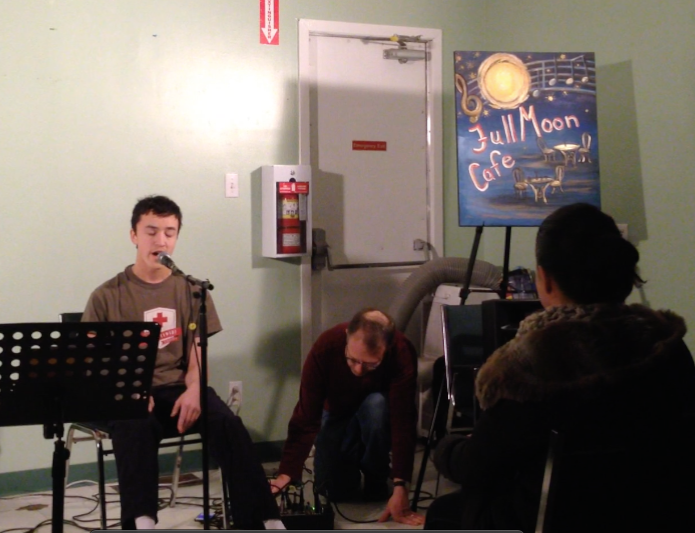 It was nice to hear Aarin and Francesco from The Veins in the acoustic and intimate setting of the Full Moon Cafe. I met these young musicians last year when they did some playing at a Suncor Community Leaders reception. They then invited me to attend a garage concert in their neighbourhood. Passionate, inspired, and inspiring, these young musicians represent the new generation of artists who will shape our future. They will join Sentimental Gentlemen for a fundraising concert on February 20th at the high school, raising money for a band trip to New Orleans. One of my favourite human beings in the world, Hope Moffatt, closed out the evening with an a cappella song that drew everyone in. Well, we thought the evening was closed, but Nathan dashed up to the mic for one final poem. Everyone helped stack the chairs, and brought the hall back to its normal state, then we went home. 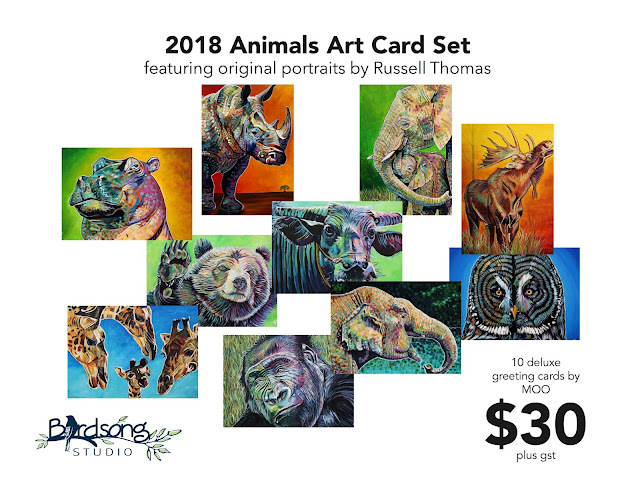 The Full Moon Cafe is sustained by volunteers who have a common interest in giving everyone a chance to put their talents in front of a supportive audience. The value of these dedicated champions cannot be overstated. The encouragement this venue provides to emerging performers is so important. We have attended on three or four occasions now, and each time I leave feeling intensely satisfied for having been there. I suspect you would have the same experience. This is truly a Fort McMurray cultural treasure.